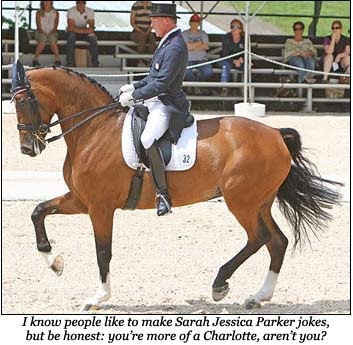 About a month ago, I started tweeting at Rafalca, Ann Romney's personal torture horse, who Ann took to England to riverdance in humiliating circles after years of ruining her youth. I even kind of hoped to get a little trending hashtag going for a while, maybe to push Rafalca to break the silence and the cycle of abuse. She never replied. Needless to say, it got discouraging after a while, speaking into the darkness when that special animal shone so brightly on the TV and the international stage. I became frustrated and had a bit of a tantrum. I tweeted these a while back, and someone reminded me of them. (I would have posted these on Tumblr, since that's where brief stuff like this belongs. But for some reason my Tumblr — or maybe all of Tumblr — refuses to render embedded tweets.) Maybe they'll keep someone else from making the same mistakes that I did. Dear Rafalca, I wrote you but still ain't callin' I left my cell, my pager and my home phone at the bottom.